Andromeda has seen quieter days, and it’s up to you to take the reins of one of many civilizations, and guide it through the many hidden dangers in the galaxy. 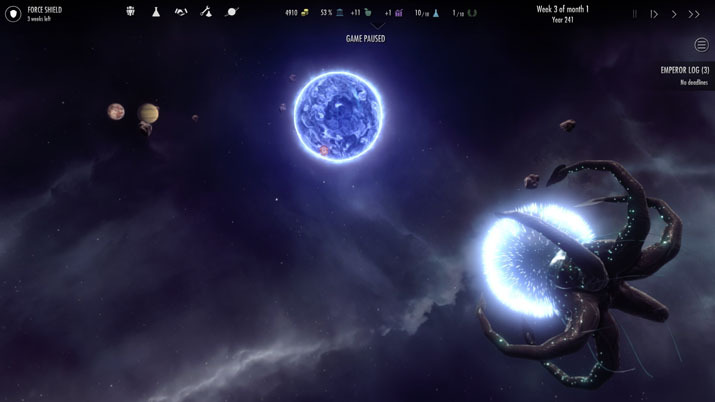 Dawn of Andromeda is a pausable, real-time space 4X game focused on providing an accessible, fast paced, fun and immersive experience that allows you to truly play as an Emperor. Build your empire, colonize new planets, interact with other factions and characters, research new technologies and build fleets so powerful, your enemies will tremble. Explore a galaxy filled with diverse factions, outlaws, merchants, pirate clans and mercenaries but also anomalies, black holes, ancient artefacts, ruins and much more. Arriving in a new system may provide new opportunities, or open a new can of worms. - Eras; unique scenarios, each with a pre-designed galaxy and background stories which you can play as one of the existing factions, each with their own victory conditions, traits, challenges and ongoing conflicts and relationships. - Explore, expand, exploit and exterminate in this real-time space strategy game, featuring real-time, non-instanced combat in a dynamic and ever-evolving galaxy. - Pre-designed, customizable and randomly generated races, each with their own unique backgrounds and traits. 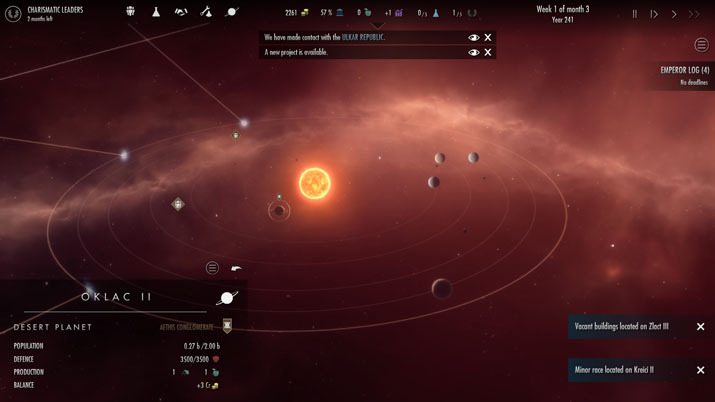 - New factions and characters can join the fray mid-game; artefacts, ruins, anomalies and a huge variety of fascinating elements are scattered throughout the galaxy and can yield new research opportunities and events. Various characters such as outlaws, merchants, travellers and others roam the galaxy. - Asymmetrical gameplay. Not all races discover space travel at the same time, some may have yet to discover it, some may have already built a mighty empire, and some races may be naturally stronger than others. However if you’d rather prefer a traditional 4X experience and start an entirely symmetrical game, it’s up to you. - Accessible and fast paced gameplay, featuring a highly-intuitive User Interface. - Reduce micromanagement by appointing governors to your colonies and council members to your empire, all of whom can be levelled up. Each come with their own unique traits, happiness and experience. - Multiple, customizable victory conditions and AI behaviors, changing how each faction operates and making for unpredictable friends and foes. - Research incredible technology, from weapons so powerful they can destroy an entire planet, to Dyson Spheres. - Explore ruins, anomalies and much more. You may even find artefacts you can study, projects you can start and come across interesting events and quests you can take on. - In-depth diplomacy system. Make allies and enemies, but beware, each action you take can change how the rest of the galaxy will view you. Destroying an entire planet, or just praising or denouncing another race, can have a deep impact on the balance of the entire galaxy. Support Grey Wold Entertainment! Get Dawn of Andromeda on Steam!